Stop losing sleep over noise in a neighboring room when you try this quick and easy DIY soundproofing technique. The struggles of sharing a home aren’t limited to arranging furniture or dividing up a chore chart among the household; they also extend to the clamor and clangor that come along with the habits of our everyday lives. Whether because of the TV volume, drum practice, slamming doors, or the traffic outside, getting a good night’s sleep can seem next to impossible—especially if you’re tossing and turning over the steep costs of putting in soundproofing. Luckily, there’s another way to reap the benefits of some much needed peace and quiet without shelling out for materials and installation. This noise-reducing paneling is both easy on the eyes and easy enough for any homeowner or apartment dweller to make in an afternoon. Start by finding the wall closest to the source of the sound. (Hint: It could be the exterior wall facing the street, or it might be the wall you share with a teenager turned budding musician.) Take measurements, and pick up as many large frames as you’ll need to cover the space. You’ll find an assortment of oversized frames priced in the $5 to $10 range at donation-based shops like Goodwill, or you can achieve a more uniform look by picking up a bulk supply of your favorite style, like these from IKEA. Lastly, gather some fabric in a print you love, craft-store batting, scissors, and a roll of tape. The key to transforming these function of these frames is in how you fill them. Replace the glass or plastic that typically protects an art print with a sheet of batting slightly smaller than the frame and a piece of fabric slightly larger than it. The padding is thick enough to absorb some of the sound before it enters the space. Since you’re working with cushy materials, arrange the layers on a smooth surface in this order for easiest stuffing: fabric on the bottom, batting in the middle, and the picture frame backing on top. Then, fold the fabric over the batting and backing—similar to wrapping a present—and tape everything down. Pop the layers into the frame, hang it on the wall, and repeat until you’ve effectively padded the problem area. For a small cost, this DIY has a big payout. 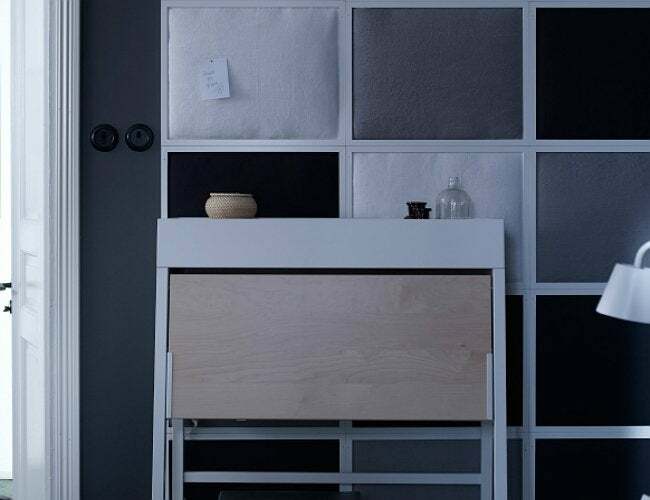 In addition to its quieting benefits, the framed fabric fronts also double as memo boards for tacking notes and photos (not to mention a way to add texture and color to an otherwise vanilla room). Once everything is in place, crawl under the covers and prepare yourself for a night of uninterrupted sleep—just don’t forget to set an alarm.